TJ Electrical were contracted to plan, design and install all power, lighting, emergency lighting and a two zone fire alarm system to a new build industrial unit in Mitcham, near Croydon. TJ Electrical were contracted to plan, design and install all power, lighting, emergency lighting and a two zone fire alarm system to a new build industrial unit in Mitcham, near Croydon. 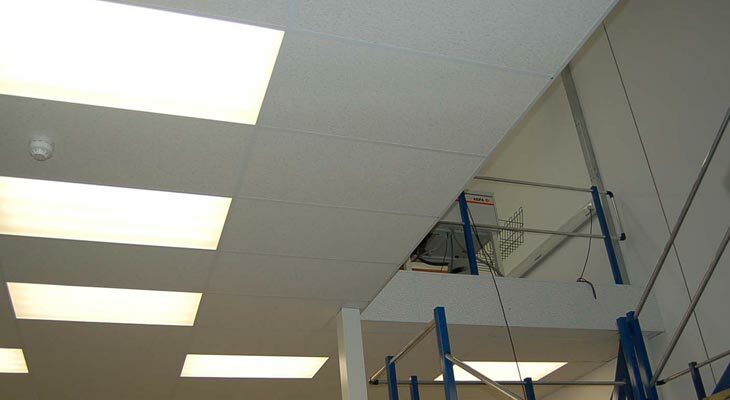 The complete fit-out of industrial electrics and fire alarm in Mitcham was for a printing company, and took a team of two of our Croydon electricians two weeks to complete. If you require fire alarms or industrial electrics in Mitcham then please contact us at TJ Electrical in Croydon. 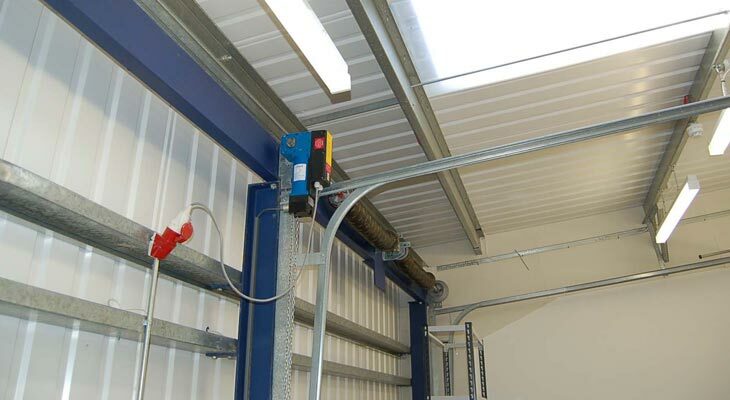 Our commercial electricians installed a three phase commando socket for controlling the main roller shutter. The power for the three phase socket (running three lives, one neutral and one earth) was supplied through galvanised conduit on its own electrical circuit from the distribution board. 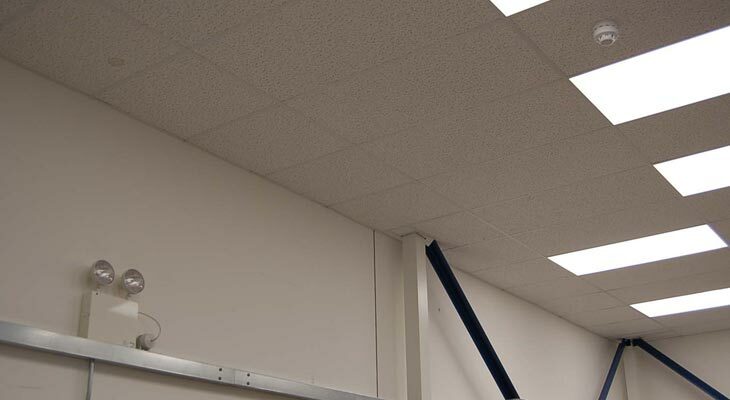 We installed large four feet by two feet recessed lighting with prismatic diffusers into the false ceiling underneath the mezzanine floor, which produced a high degree of lux light for the printing equipment below. Here we also fitted a smoke detector with sounder built in. On the ground floor we installed 3 by 3 galvanised metal trunking at high level and ran all electrical power circuits through it. These industrial electrics in Mitcham were designed with future changes in mind. The trunking was easily adaptable to add more sockets / lights / power. Here we see galvanised conduit with a metal clad socket and a commando plug ready to power the three phase machinery. 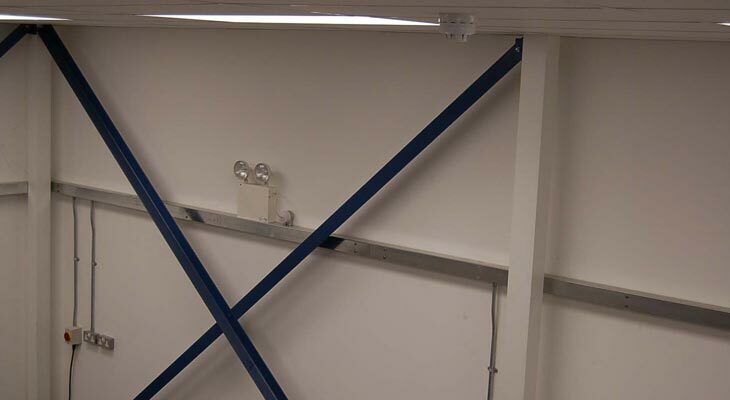 On top of the trunking we installed powerful twin spot emergency lights. Please contact TJ Electrical if you require emergency lighting in Mitcham. 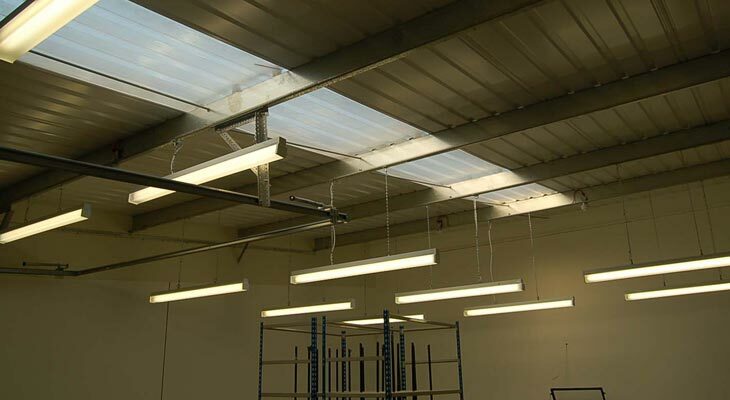 With the ceilings being around six metres high we decided to suspend fluorescent lighting from the perlins, a slightly cheaper alternative to high bay lighting used on ten metre ceilings. A scissor lift was utilized for speed because this unit was empty for our Croydon electrical installers. © TJ Electrical UK. All rights reserved.